Tomato Patch: Brush your tomato blossoms? Would you really do it? 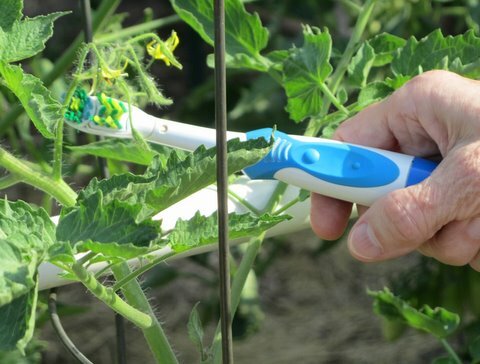 Did you brush your tomato blossoms today? Patterson Clark’s “Urban Jungle” feature, “Plight of the bumblebee,” in the Washington Post this week reminded me of the continuing discussion about how tomato plants are pollinated. Patterson’s first paragraph sets the stage: “That tomato ripening in your garden probably got its start after a visit from a bumblebee.” He calls bumblebees “buzz pollinators” that “will clinch a flower in its jaws and rapidly vibrate its wing muscles to give the blossom a good shake” to dislodge pollen that the bee collects. In the process, the tomato flower is pollinated and fruit formation begins. That’s an important part of the tomato pollination story, but bumblebees aren’t the only “buzz pollinators” at work in the Tomato Patch. In fact, “sonication” is a more accurate word to describe the vibrating process that loosens the pollen in the male part of a tomato blossom and allows it to come into contact with, and fertilize, the female part of the same blossom. Other than bees, other important sonicators—if there is such a word—are wind, animals, and humans. You can easily imagine how spring and summer breezes—or a gusty thunderstorm– vibrate or shake tomato plants so pollination takes place. Your golden retriever’s wagging tail might do the job too—or a neighborhood squirrel climbing a plant to rob you of a growing fruit. And humans? When we work in the Tomato Patch, our hand-weeding, hoeing, and sucker pinching often vibrate or shake our plants. Hey, we’re “buzz pollinators”—aren’t you impressed? But some growers go out of their way and intentionally assist the pollination process by gently tapping the stem of a blossom truss with a finger. I’ve read suggestions to carry a pencil to tap on the stems. One online recommendation urged three to five shakings a day. I’ve never tapped tomato flowers with a pencil or vibrated them with a toothbrush. We don’t have a dog with a long wagging tail. Other than minor vibrations I cause when doing routine gardening chores in the Tomato Patch, I’ve always left the job of pollination to nature’s big-two tomato pollinators—the wind and the bumblebees and other insects. But it’s confession time. Since I began thinking about writing this blog, I’ve paused a time or two to tap new blossom trusses with my right index finger—just to make sure, of course. To read Patterson Clark’s feature, which sparked my thinking about tomato pollination, CLICK HERE.